Call us basic, but when it comes to fall, yoga pants and especially pumpkins, we literally can’t even. Pumpkin season is upon us! And pumpkins can do a latte more for you than that foamy hot drink or pie. They’re actually proven to have many benefits beyond their great taste. #PSL followers, Pumpkin Patch ‘grammers — you may be thinking you’re completely fall ready. But, here’s something you may have not yet pumpkin-ified: Your skincare. Yes, seriously. Pumpkins are packed with fiber and contain vitamins A, B, C, E and K and super minerals, such as iron, zinc, magnesium. As an overall health benefit, pumpkins are a rich source of phytosterols, which according to research — 2 grams of phytosterol per day can lower LDL “bad” cholesterol by up to 10%. They are also high in tryptophan — an amino acid that helps produce happy hormone, serotonin. In other words, eating pumpkins can improve your mood. In fact, pumpkin is such a high-performing active ingredient that we use it in several of our best selling products. Due to its small molecular structure, pumpkin benefits can penetrate deeply into the skin to combat a variety of skin concerns and treat your skin with powerful nutrients to reveal a brighter, more radiant complexion. Fiber is a great source of muscle-building protein, which is both true for food and skincare. Fiber and Vitamin A are super nutrients that actually boost collagen production and reduce fine lines and wrinkles. Other powerful anti-aging nutrients found in pumpkins are Zinc and Vitamin C, which help to brighten and tighten. Pumpkin may be one of this season’s cures for pesky acne. While being rich in Vitamin A, pumpkins can help fight inflammation and boost hydration in the skin. Pumpkin also contains zinc, which helps control hormone levels and excessive oil production that can lead to acne. We paired it with natural Retinol alternative — Moth Bean Seed — in our “Immunity Builder,” High Endurance Crème to strengthen skin and increase cell turnover. Pumpkins are packed with two of our favorite natural exfoliants — fruit enyzmes and Alpha Hydroxy Acids. 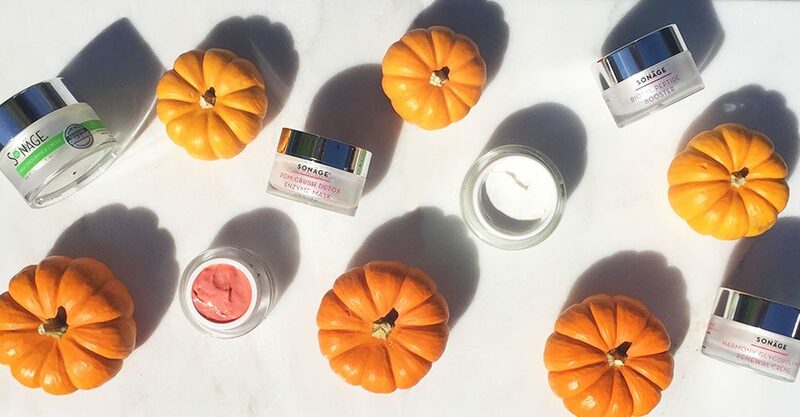 With the fall and winter weather drying out your skin, enzymes and AHAs from pumpkins increase cell turnover and reveal resurfaced, brighter, glowing skin. 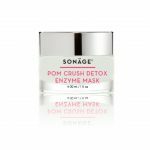 Pom Crush Detox Enzyme Mask contains six fruit enzymes — including pumpkin — that will help to achieve a resurfacing and softening effect. Pumpkins contain essential fatty acids that absorb into the skin and provide long-lasting hydration. These acids help to balance oil while moisturizing dry skin. For this reason, we love to use pumpkin in our crèmes as it deeply hydrates the skin, without any residual greasiness. In addition to being high in Vitamins A and C, pumpkin also contains high amounts of Vitamin E and essential fatty acids. These antioxidants strengthen the skin and protect against free radical damage by strengthening the skin and repelling things that can damage it. These are necessary in maintaining good barrier function of the skin, further protecting you from outside irritants and free radicals. Using skincare products that contain pumpkin helps maximize the effectiveness of your natural SPF. For a Jack-O’-Lantern level of radiance this fall, it’s so simple. Spice up your skincare routine with non-toxic products that list pumpkin as a key ingredient. Six natural, potent enzymes work harmoniously together to gently hold onto and remove dead cells, while helping hydrolysis turn proteins into peptides and amino acids to improve skin health. Pumpkin is one of its main ingredients for exfoliation and smoothing fine lines.